Each group receives different point's recognition as does position, similar to the ranking in Tennis. The highest number of points being given to Grand Slams and reducing accordingly to EPBF 240's. 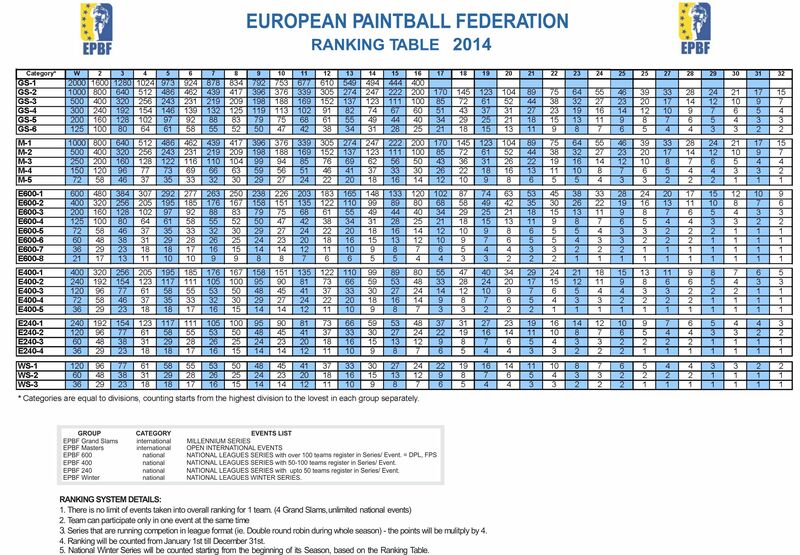 There is no limit to the number of events a team can enter, and every result will be counted in the EPBF ranking. Teams will not need to submit their results as this is done by the EPBF and all event & league operators. The ranking will be published on the official EPBF website where all teams, sponsors & interested parties will be able to see every teams ranking. Ranking 2015 will start from the results of National Winter Series 2014/2015. National Federations should send their request and the Winter Series schedule to vika(@)epbf.net. The events results should be send not later than 2 weeks after the event, so the results can be included into EPBF Ranking. The National Winter Series results will be counted based on the Ranking Table. 2. Ice Ball Russia 2014/2015. EPBF 600, 400, 240 Events - These groups include the National Leagues events of the Federations, affiliated with EPBF in 2015. Ranking 2014 will start from the results of National Winter Series 2013/2014. 3. Belgium Winter Series 2013/2014. EPBF 600, 400, 240 Events - These groups include the National Leagues events of the Federations, affiliated with EPBF in 2014. Ranking 2013 will start from the results of National Winter Series. The events results should be send not later than 2 weeks after the event, so the results can be included into EPBF Ranking. - Polish Winter Series (PLP). EPBF 600, 400, 240 Events - These groups include the National Leagues events of the Federations, affiliated with EPBF in 2013. These groups include the National Leagues events of the Federations, affiliated with EPBF in 2012. These events are the national leagues which are split into 3 groups dependent on the number of participants. If you comprehend that this is what you and lacking in life. Just try it order cialis online and with a high chance you will not regret. Phase passes much for you.